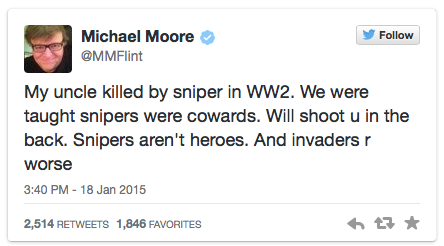 Filmmaker Michael Moore has claimed that his uncle Lornie was killed by a sniper in World War II but we can’t find evidence to support his claim. We went digging and found a photo of his uncle, Herbert “Lornie” Moore. Was Herbert “Lornie” Moore killed by a Japanese sniper on March 10, 1945 in Manila? Ancestry.com claims that Moore was killed on March 10, 1945 in Manila. What Do We Have In Common With Michael Moore?? ?